In 2018 we added three new 3rd party services to our growing partner ecosystem on IBM Cloud. From IoT to A.I. to wealth management, we’re adding more services to give you, our developers, what you need to build compelling digital solutions. Accrete.AI: Rational Exuberance Rational Exuberance helps you tackle information overload in the context of confusing Fedspeak and cross-talk amongst Fed governors. It parses news, economic data, and official Federal Open Market Committee (FOMC) statements combining all data to forecast interest rate changes. Highlights • Rational Exuberance reads and distills tens of thousands of articles looking for every nuance related to inflation and employments in real-time. • Trained by experts to understand what it means to be dovish and hawkish in different contexts it has >85% classification accuracy saving 1000s of man-hours. • The platform reads and distills tens of thousands of articles looking for every nuance related to inflation and employment in real-time. This approach has correctly foretasted the 17 previous FOMC interest rate policy decisions. Use case(s) Fed communications contain too much nuanced information related to monetary policy for humans to process. Divergences between the Fed’s interpretation of economic indicators and the market’s interpretation of the same data create compelling investment opportunities. Due to our biological processing limits, opportunities are often missed. To solve this problem, Rational Exuberance continuously analyzes 1000s of articles per day to find divergences between the Fed and the market and generates trading alerts and policy forecasts with real-time confidence scores. Accrete.AI: Rumor Hound Rumor Hound scrapes thousands of unstructured data sources in real-time, identifies rumors buried in the data, and provides a filtered list of rumored acquisition targets scored by time and credibility. Highlights • Helps analysts generate alpha by surfacing rumors early in the information cycle. • Trained by former experienced M&A analysts, Rumor Hound pinpoints where rumors originate amidst an ocean of digital channels. Use case(s) M&A rumors emanate from any one of countless different data sources. It is impossible for human traders to effectively sift through thousands of disparate data sources in a timely manner and surface the credible rumors that move stock prices. Rumor Hound scrapes thousands of disparate, unstructured data sources in real-time and identifies rumors buried in the data, while providing a filtered list of rumored acquisition targets scored by time and credibility. The platform acts as an analyst army working 24/7 to find actionable rumors and pushes them out based on specific criteria. This ability turbocharges research speeds and reduces the time equivalent to thousands of man-hours of tedious mental labor while maintaining >90% classification accuracy. Powered by MACI, Rumor Hound gets smarter every day, quantifying every data point and connecting the dots before the rest of the street even finds the dots. 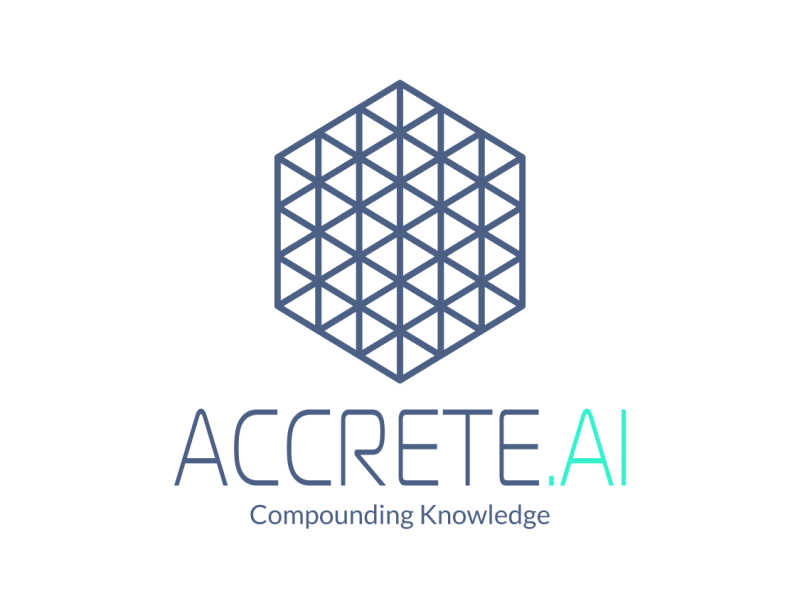 Accrete.AI: Topic Deltas Imagine having the ability to listen to every conference call for the S&P 500 (current and historical), categorize every topic discussed, remember every nuance mentioned, and instantly compare the differences over time and against market consensus. This is the power of Topic Deltas delivers. Highlights • Gain both greater accuracy and greater breadth in earnings call analysis. • Focus exclusively on ideation letting Topic Deltas focuses on data extraction, transformation, and categorization. • Topic Deltas consensus hours of analysis into minutes with >90% accuracy mapping key concepts to nuances in language. • Helps users analyze subtle nuances in earnings calls with superhuman breadth and accuracy. Use case(s) Earnings calls contain hidden nuances that are difficult for human beings to decipher but have significant implications for stocks. It is very difficult to contrast statements made during earnings calls, on a per-topic bases, against market expectations over time, and at scale. In order to solve this problem, Topic Deltas listens to earnings calls in real-time, quantifying nuance and measuring sentiment deltas across calls and against market expectations. The product tackles information overload and complexity by transforming messy data into quantifiable numbers allowing for quick apples 2 apples comparisons, automatically parses earning call transcripts into topic concepts. Phunware Mobile Marketing Automation Unleash the power of location to bring context and personalization to your mobile marketing strategy. Highlights • Brands can send targeted messages to app users based on their location and attributes. • Marketing Automation campaigns are displayed as notifications on the mobile devices of app users, and can appear even when devices are locked. • Engage consumers as they enter, dwell in and exit your physical places of business and use the app to influence their next steps and enhance their experience with your brand. Use case(s) There are three kinds of marketing campaigns that businesses can launch to keep app audience engaged. Broadcast Campaigns: Reach broad app audiences with messages sent to all app users sharing given attribute/profiles or within a location one time only. Use Case: Target specific audience segments with more contextually relevant messages based on user actions or preferences. Entry/Exit Campaigns: Target audiences at a more granular level. Messages are sent to users who pass into, out of, or stay within range of tagged beacons over a period of time. Use Case: Target audiences in the moment when they are in a specific departments, wing or near a product display. Phunware Location Based Services Bring your venue to life and change how users experience your brand with navigation within your physical locations. Highlights • Driven by Mapping and Location SDKs, Phunware’s Location Based Services (LBS) module provides a set of tools to enable the display of indoor venue maps, points of interest, and wayfinding throughout these venues. • Integration with iOS and Android devices with powerful facility-wide navigation. Use case(s) Developers can utilize these LBS SDKs to offer app users either: Static wayfinding, where users can interact with a map with highlighted routes and step by step directions, but do not see their actual position or movements reflected on the map. Dynamic wayfinding, where users can interact with a map with highlighted routes and step by step directions, including a blue dot that mirrors users’ their actual position and movements. In addition, a sample including basic user interface code is provided, which can be used as a starting point by developers. This basic UI can be used as is or customized and enhanced to support specific app use cases and branding needs. For example, additional use cases include saving a custom POI or sharing a user’s location. These types of customized behaviors are driven by the application code using the data libraries and APIs available through the SDK. Be sure to check out these latest 3rd party services on IBM Cloud. You can sign up now to start building on IBM Cloud!